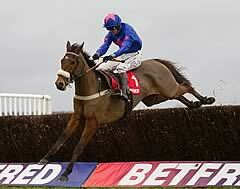 Cue Card dispelled stamina doubts as he led from pillar-to-post to win a top-class renewal of the Betfair Chase at Haydock. Colin Tizzard's 2013 Ryanair Chase hero had only run over three miles once before, in last season's King George, where he made early mistakes in heavy ground. Allowed an easy lead over three miles and a furlong on this occasion, Joe Tizzard was able to dictate his own pace, and though last year's winner Silviniaco Conti looked a big danger three from home, as did Dynaste, the jockey had still not asked for everything and after jumping the last Cue Card (9-1) sprinted clear to win by four and a half lengths. Dynaste finished second and the big disappointment of the race was the Gold Cup winner Bobs Worth, who dropped away tamely. Colin Tizzard said: "It's almost brought a tear to my eye. Joe was real coy until about three out, he just sat there and never moved. He jumped better than he ever has. He was on his game today, that's for sure. "It would have been easier staying over two miles as that is where his form was and we were looking at Ascot today with two runners thinking 'why are we here', but this proves he does stay. "To win these big races you've got to be right on the day. It's a long time until March but he was dead on his job today. There's plenty of water to go under the bridge before March. I assume he'll go to the King George next and then I'm sure he'll end up at Cheltenham in one of the races. "It's everybody's dream to have a horse good enough to run in the Gold Cup and I'm sure unless we get beat by stayers next time that will be on his compass. Everyone says Champion Bumper horses will be three-milers, but because he has so much pace we've never done it." Joe Tizzard said: "He was brilliant today, he was a different horse from Exeter (third in the Haldon Gold Cup), he was bang on the money and proved what he is. He finds things so easy, he's brilliant to ride. The pace he's got is lovely in a race like this, we've been running him over the wrong trip! "He's got that gear which all the best horses have, it's so nice he's proved he gets the trip and it makes him a real Gold Cup horse." 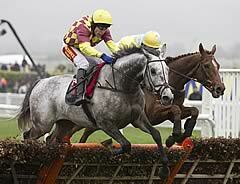 David Pipe, trainer of Dynaste, said: "He ran the best race of his life. There were a lot of good horses behind us and it shows we can have some fun with him this season. Hopefully the King Geoege will be the next stop. He has run his heart out and the winner was very good today. It's not often the Pipes say we'd take second beforehand, but we would have today." Nicky Henderson said of Bobs Worth: "They've turned the track round but the two-and-a-half-milers have come to the fore. They just took him out of his comfort zone on soft ground first time out. That's why we said we would never think of the King George and this has turned out similar. 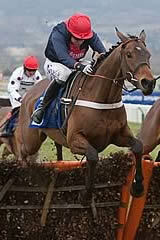 All he wants is that hill (at Cheltenham). "We'll have to look at the Lexus Chase (at Leopardstown on December 28). It's a long time until March. It's sad because nobody wants to see the Gold Cup winner come back and get beaten like that. It's not what we wanted, but the writing was on the wall some way out. "His jumping was all right but he couldn't do what he likes to do. The track was just too sharp for him. Barry (Geraghty) said not to take any negatives out of it. "Long Run jumped much better today and I'm sure he'll go back to try and win another King George, but I imagine the three that beat him today will all be there, too. I imagine he'll have an entry in the Grand National as well and after the way he jumped today I wouldn't put them (the owners) off."